"The biggest benefit I think is convenience," said Patrick Mesterton, co-founder and CEO of Epicenter. As a demonstration, he unlocks a door by merely waving near it. "It basically replaces a lot of things you have, other communication devices, whether it be credit cards or keys." The technology in itself is not new. Such chips are used as virtual collar plates for pets. Companies use them to track deliveries. It's just never been used to tag employees on a broad scale before. Epicenter and a handful of other companies are the first to make chip implants broadly available. "Of course, putting things into your body is quite a big step to do and it was even for me at first," said Mesterton, remembering how he initially had had doubts. "But then on the other hand, I mean, people have been implanting things into their body, like pacemakers and stuff to control your heart," he said. "That's a way, way more serious thing than having a small chip that can actually communicate with devices." The small implants use Near Field Communication (NFC) technology, the same as in contactless credit cards or mobile payments. When activated by a reader a few centimeters (inches) away, a small amount of data flows between the two devices via electromagnetic waves. The implants are "passive," meaning they contain information that other devices can read, but cannot read information themselves. 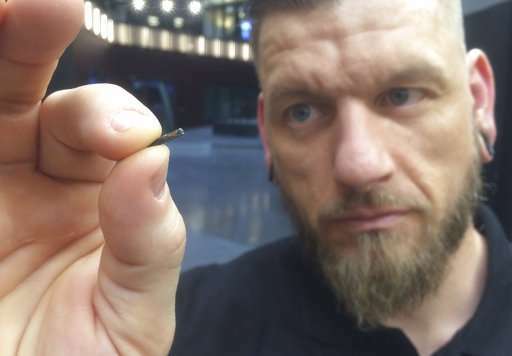 Ben Libberton, a microbiologist at Stockholm's Karolinska Institute, says hackers could conceivably gain huge swathes of information from embedded microchips. The ethical dilemmas will become bigger the more sophisticated the microchips become. "The data that you could possibly get from a chip that is embedded in your body is a lot different from the data that you can get from a smartphone," he says. "Conceptually you could get data about your health, you could get data about your whereabouts, how often you're working, how long you're working, if you're taking toilet breaks and things like that." "People ask me; 'Are you chipped?' and I say; 'Yes, why not,'" said Fredric Kaijser, 47, the chief experience officer at Epicenter. "And they all get excited about privacy issues and what that means and so forth. And for me it's just a matter of I like to try new things and just see it as more of an enabler and what that would bring into the future." The implants have become so popular that Epicenter workers stage monthly events where attendees have the option of being "chipped" for free. He injects the implants—using pre-loaded syringes—into the fleshy area of the hand, just next to the thumb. The process lasts a few seconds, and more often than not there are no screams and barely a drop of blood. "The next step for electronics is to move into the body," he says. While biologically safe, the data generated by the chips can show how often an employee comes to work or what they buy. Unlike company swipe cards or smartphones, which can generate the same data, a person cannot easily separate themselves from the chip. Erm - the data of what they buy and how often they come to work is certainly not stored on the chip. The chip just holds the key. So there's no real difference between this chip and a card. The chip is seen as somehow more secure. The trade-off is not of any form of balance, when one looks at the implications. It's the centralized database at the workplace that records that, the chip merely transfers the data or trips the data-point in said door or piece of equipment. So now all you need for access is a hand.